17 year old twins Taylor and Haydn Wootton are to return to the Invicta Dynamos full time in 2016/17 after the forwards chose to commit their immediate futures to playing senior hockey in the NIHL South’s top tier. Both Taylor and Haydn Wootton progressed through the junior ranks in Kent to under 16s level before moving to the nearby Lee Valley Lions for 2012/13. 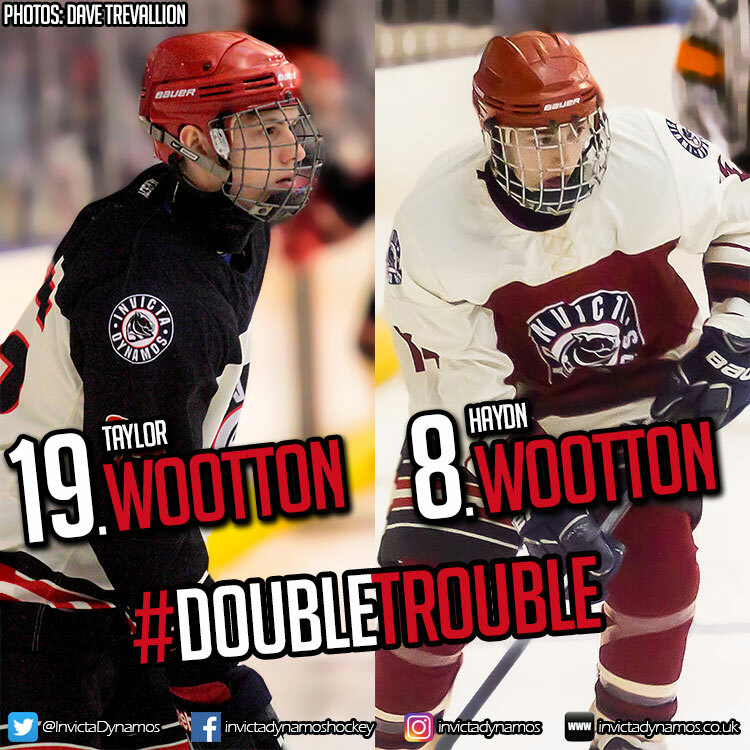 Over two seasons the Wootton twins represented the Alexandra Palace based outfit at under 16s and under 18s before securing an NIHL South Division 1 berth with the London Raiders come 2014/15. 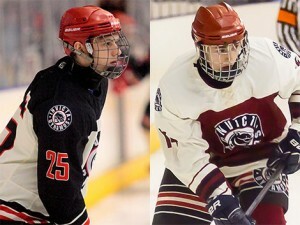 On two-way deals with the Guildford Phoenix under 18s, both skaters made a handful of appearances in the NIHL’s top tier whilst spending the majority of their time representing the junior side. Last season Dynamos Head Coach Kevin Parrish then invited the young forwards back to the club that had previously been their home with the duo maintaining their two-way deal in Guildford. In 2015/16 Taylor Wootton dressed 16 times for the under 18s and tallied an impressive 22 goals and 21 assists for a total of 43 points. He also appeared for the under 20s on 14 occasions – a further 10 strikes and a hand in 11 more giving him a return of 21 points at the higher level. Meanwhile the skater wore the number 25 jersey 15 times for the Mos and grabbed his first point in the NIHL South Division 1 with an assist at home against the Milton Keynes Thunder in December. Meanwhile Haydn Wootton wore the ‘A’ of alternate captain for the Guildford under 18s and featured 18 times whilst notching 15 goals and 23 assists for 38 points along the way. He amassed another 22 for the under 20s – finding the twine 6 times whilst teeing up his teammates for 16 more to help his side to a top placed finish in the league. Meanwhile he too claimed his first assist in the NIHL South’s top tier in the same game as his brother – at home against the Milton Keynes Thunder in the final month of 2015 in one of his 17 Dynamos appearances. Speaking on the return of Taylor and Haydn Wootton, Head Coach Kevin Parrish said, “Taylor and Haydn are two very promising players with very promising careers ahead of them so we’re very pleased the pair are back at the club for 2016/17. Both skaters had the option of continuing to split their time between the Dynamos and the under 20s at Guildford but both have made the decision to commit to the Mos full time this season. They had excellent years with their junior clubs last term and brought plenty of energy to the ice when they dressed for us throughout the year. Their potential is there for all to see and both Taylor and Haydn are up for the challenge of now making that step up to the NIHL South’s top tier full time”. Taylor and Haydn Wootton are the fifteenth and sixteenth players to make the Mos roster ahead of 2016/17 and Head Coach Kevin Parrish is set to unveil another on Friday with news of a second new face joining the team before the weekend. Warm-up Jersey – For just £125 get your name or logo printed on the back of Taylor or Haydn Wootton’s warm-up jerseys. Sponsors are then presented with the jersey to keep at the end of the season. Game jerseys – Get your name or logo on the back of Taylor or Haydn Wootton’s game jerseys and become a part of the action.